From the Cumberland Gap to the Atlantic Ocean, this is Virginia Water Radio for the week of May 12, 2014. This week, we feature another mystery sound. Have a listen for about 10 seconds, and see if you can guess what coastal inhabitant is making this sound. And here’s a hint: it’s not a bird dog, but if you’re thinking “dog-bird,” you’re skimming close to the answer. If you guessed a Black Skimmer, you’re right! And if you guessed “seadog,” you’re also right, because a bark-like call helps give this coastal bird that canine nickname. One of only three skimmer species in the world, Black Skimmers are found along coastal areas of North and South America. Sandy beaches on Virginia’s barrier islands attract this bird during its breeding season, starting in April and with the peak of egg hatching in June and July. Black Skimmers are distinctive for their knife-like, black-and-red bill, whose lower part is longer than the upper. To feed upon small fish and crustaceans, the bird uses long, flexible wings to skim along water surfaces, with the protruding lower bill in the water. When it detects prey, the bird snaps down its upper jaw, captures the prey, and swallows it, while still in flight. These flying and feeding habits led to Black Skimmers being poetically described by ornithologist R.C. Murphy in 1936 as “unworldly...aerial beagles....” Thanks to Lang Elliott for permission to use this week’s sounds. For other water sounds and music, and for more Virginia water information, visit our Web site at virginiawaterradio.org, or call us at (540) 231-5463. From the Virginia Water Resources Research Center in Blacksburg, I’m Alan Raflo, thanking you for listening, and wishing you health, wisdom, and good water. 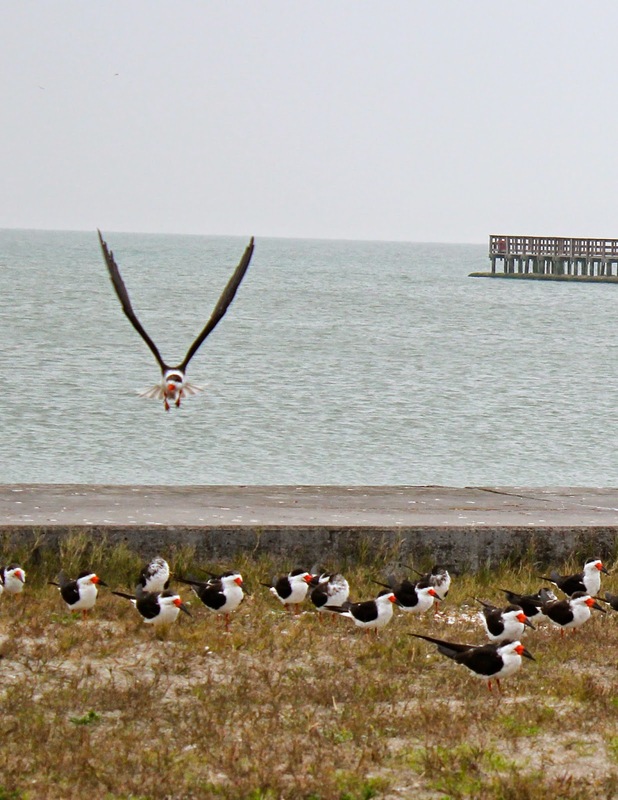 Black Skimmer flock showing the birds’ characteristic habit of facing the same direction. Photo taken along Aransas Bay at Rockport, Texas, in early March 2014. Courtesy of Gloria and Stephen Schoenholtz. Black Skimmer in flight, showing the bird’s long wings. Photo taken along Aransas Bay at Rockport, Texas, in early March 2014. Courtesy of Gloria and Stephen Schoenholtz. The sounds of the Black Skimmer were taken from the Stokes Field Guide to Bird Songs-Eastern Region CD set, by Lang Elliott with Donald and Lillian Stokes (Time Warner Audio Books, copyright 1997), used with permission of Lang Elliott, whose work is available online at http://www.langelliott.com/ and the “Music of Nature” Web site, http://www.musicofnature.org/. “Black Skimmer (Rynchops niger),” by Spike Knuth, Outdoor Report (Sept. 11, 2013), Virginia Department of Game and Inland Fisheries; available online at http://www.dgif.virginia.gov/outdoor-report/2013/09/11/. “Black Skimmer (Rynchops niger),” by Julie G. Bradshaw, The Virginia Wetlands Report, Vol. 11, No. 1 (Winter 1996), pp. 3-4, Virginia Institute of Marine Science; available online at http://ccrm.vims.edu/publications/publications_topics/vwr/vwr-winter96.pdf. “Fish and Wildlife Information Service,” Virginia Department of Game and Inland Fisheries, online at http://vafwis.org/fwis/?Title=VaFWIS+Species+Information+By+Name&vUT=Visitor. A Guide to Field Identification of Birds of North America, by Chandler S. Robbins et al. (New York: St. Martin’s Press, 2001). “All About Birds,” Cornell University Lab of Ornithology, online at http://www.allaboutbirds.org; and “Birds of North America Online” Cornell University Lab of Ornithology and American Ornithologists’ Union, online at http://bna.birds.cornell.edu/bna (subscription required). The R.C. Murphy quote was found at these sites, which identify the original source as R. C. Murphy, Oceanic birds of South America--Vol. 2 (1936), American Museum of Natural History, New York. Virginia Society of Ornithology at www.virginiabirds.net. E-bird Web site at http://ebird.org/content/ebird/, maintained by the Cornell Lab and the Audubon Society. Here you can find locations of species observations made by contributors, and you can sign up to contribute your own observations. For news, events, and resources relevant to Virginia's water resources, grouped into categories, please visit the Virginia Water Central News Grouper, available online at http://vawatercentralnewsgrouper.wordpress.com/.